The Forensic Crash Unit is investigating a fatal traffic crash involving a cyclist and car in Indooroopilly this morning. The crash occurred around 6:50am on Kate Street near the intersection at Boundary Road involving a cyclist travelling down the road and a car travelling in the opposite direction. The cyclist, a 54-year-old Brookfield man died at the scene. The 37-year-old male driver of the vehicle was not physically injured. Two men have been charged after two 15-year-old boys were hit in the face with paint pellets last night. At around 7.15pm, a group of boys were walking along Pelican Waters Boulevard when two of them they were struck with paint pellets, fired from a passing vehicle. One of the boys was struck near his eye and was taken to the Sunshine Coast University Hospital and the other was struck on the cheek. A 17-year-old Little Mountain man and 18-year-old Pelican Waters have been charged with two counts each of assault occasioning bodily harm. Both men are due to appear at the Caloundra Magistrates Court on November 22. Police are investigating following the armed robbery of a supermarket in Rothwell this morning. A man walked into the business on Bremner Road around 5.10am, selected a flavoured milk from the drink fridge and approached the front counter. 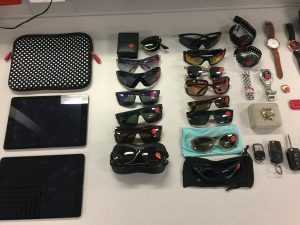 He then put a bag on the front counter and demanded money and cigarettes from the female cashier before revealing what appeared to be a firearm from the pocket of his jumper. 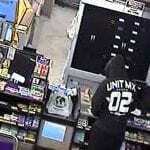 The cashier complied and handed over a sum of cash and the man fled the scene. Police have released CCTV images (below) of the man who is described as Caucasian in appearance, around 170cm tall with a medium build, short dark hair with lines shaved into the side. He was wearing a black hooded jumper with black tracksuit pants and was carrying a black bag. Police are urging anyone who may recognise the man or have further information about the incident to contact Policelink or Crime Stoppers. Bundaberg Police have charged a boy after a tourist was allegedly robbed at knifepoint in Bundaberg North last night. It will be alleged a 26-year-old woman was walking along Perry Street around 11.15pm when she noticed two male teenagers following close behind her. She crossed the road onto Station Street when one of the youths allegedly rode in front of her on a scooter, produced a knife and grabbed her wrist, demanding she hand over her mobile phone. The woman refused and the boy allegedly grabbed the phone from her hand before fleeing the scene with the second boy. The woman was not injured as a result of the incident. Police have since charged a 16-year-old Bundaberg North boy with armed robbery. Police have reunited a girl with her family after she was located walking in a street at Coomera today. Police would like to thank the public and the media for their assistance.